"Humans are more complicated than it said in the pamphlet." After releasing three films last year—the very good Mr. Peabody & Sherman and How to Train Your Dragon 2, and the woefully average Penguins of Madagascar—Dreamworks Animation Studio is only releasing one film in 2015, and it's a cast-off from last year. Home was originally slated for release last November, which makes the Christmas elements of the film make more sense, but was flip-flopped with Penguins last summer. While the move was done to boost familiarity and thereby boost profits, it seems that they severely the undervalued the much better film. Home makes its bed blanketed securely in convention and playing everything safe, but it works almost despite those well-worn tropes. The fact that it's an adaptation of a very smart book titled The True Meaning of Smekday by Adam Rex helps it to score points for originality, but it illustrates very clearly the perils of condensing a fairly wordy book into a ninety minute film. The film centers around an alien race called the Boov, who have mastered the art of running away from their fearsome foe, the Gorg. Their latest planetary conquest is Earth, where their superior technology allow them to relocate all humans to Australia, but their inferior decision making sets them up to be more unwelcome invaders than benevolent overlords. The Boov succeed due to their ability to think with one mind, but one Boov in particular named Oh (Jim Parsons) secretly harbors a desire to be more like humans. Following a series of mishaps where he accidentally divulges the Boov's new location to the Gorg, Oh ends up on the run where he crosses paths with Tip (Rihanna), a 12-year old girl looking for her mother (Jennifer Lopez) who was relocated by the Boov. The two misfits then set out on a journey to clear Oh's name and find Tip's mother, and the film works best when it's nothing more than a culture clash road trip movie. It's hard to fault the film for having the wherewithal to retain a lot of this character development, but it ends up giving short shrift to the more immediate and thrilling B-plot of the impending Gorg invasion. It's a real double-edged sword situation with Home, because the intense focus on Oh and Tip coming to know one another and respect each other's ability to think and feel is all done extremely well. What's disheartening is when that stuff is jettisoned in favor of needlessly eye-popping action sequences, which are all integral to the plot of the film and look amazing. Those moments seem to grind the film to a halt for some reason, and the whole film feels like it was noted to death with a lot of, "We need more of this and more of this and more of this," to the point where 90 minutes just can't contain "more" of anything. It's the most conflicted I've been about a film in a long time because I think there are some genuinely great moments that rival the best work in a number of Dreamworks films, but it also has a bombastically distracting score, a litany of groan inducing pop songs, and some of the most juvenile humor imaginable. The film shares a lot of DNA with Lilo & Stitch, and I'd be willing to bet that anyone enchanted with that film will find themselves similarly attached to this film's central characters. Also like that film, this has one foot in the future of the studio, demonstrating a number of good qualities that Dreamworks could use more of, but it's other foot is firmly planted in the studio's path, adhering to a paint by numbers storytelling formula and thinking that louder means better. This is indicative of Dreamworks' problems from the beginning, positioning themselves as the anti-Disney before finally coming around to the realization that they too could tell original stories in a visually interesting way, yet they never seem to want to truly let go of their black sheep past. Having said all of that, I will redirect your attention back to the things that work incredibly well in the film's favor. 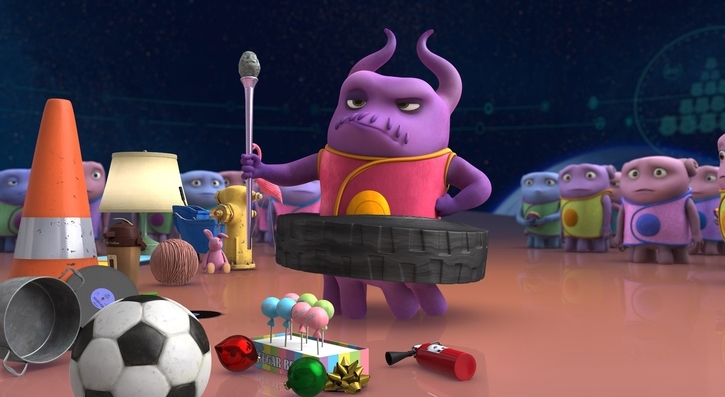 Oh is a very endearing character, reminiscent of Wreck-It Ralph, but somehow infinitely more adorable and cuddly. Parsons does excellent work with the character, who the advertising led me to believe was going to be some sort of Jar Jar Binks-sized annoyance, but is actually infused with a lot more nuance. I was similarly dismayed to see that Rihanna, a grown woman, would be voicing the 12-year old Tip, but she's actually very good. Following the strange stunt casting of the studio's past, it's refreshing to see a non-white character voiced by a non-white performer, and what's more, one who shares the character's country of origin. Steve Martin is also a lot of fun as the dim-bulb Boov leader, providing the film with some of its biggest laughs courtesy of his special brand of braggadocio. Martin fans will also get a kick out of his tiny and completely throwaway reference to The Jerk. The film's entire design is also amazing. The bright colors and soft edges to the characters will make the film safe for people with children of any age, and it utilizes some of the best 3D sight gags I've seen in some time. The filmmakers and studio have wisely marketed the film in such a way, and the savvy and synergistic manner of their advertising campaign may prove to find them breathing down Disney's neck, though it's also very reminiscent of Illumination's ability to put those Minions front and center in their Despicable Me franchise. Don't be surprised to hear your little ones talking like Oh and demanding a house full of little plastic replicas of him and his brethren. Home manages to work despite the numerous hurdles in its path. If only the four month delay had done more to shape the film in the direction of a buddy movie rather than an end of the world movie, but even baby steps are asking a lot these days. Thankfully this film's baby steps are firmly in the right direction, and studios beyond Pixar and LAIKA can begin trusting children more to enjoy a well-told story, rather than bombarding them with familiarity. It has problems, but none that parents of children craving just a little bit more from their entertainment can't look past. If this does end up becoming a franchise, I have hope for its future because it seems to know where it's heading. I only wish, at the very least, I could say that about more films.